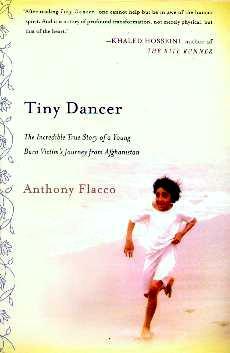 This is the tragic yet joyful story about a little girl who lived in Farah, Afghanistan, who accidentally set herself on fire while dancing around her little mud hut of a home. The description of this 9-year old's agony is bone-chilling. Her family was poor and a girl in Afghanistan, at the time, wasn't much to anyone and so poor Zubaida grappled with being "treated" by anyone locally who'd help her - mostly just putting salve on her wounds to try and stop the infection. This took place months before September 11, 2001 and before American soldiers were deployed en masse to nearby Kandahar. A Green Beret (who remains anonymous) saw the plight of little Zubaida, "horribly burned that her own scars were slowly killing her", and decided to step in and help. Her father was unaware of the enormity and full implications as to why the U.S. soldiers were there, but he had no other avenue of hope. This is the remarkable story of how she managed to creep into people's hearts, and despite the ongoing suspicion (are they terrorists just using this poor child to infiltrate the American camp? ), to cut through so much red tape. Zubaida never once gave up her fight although her screams may have indicated her time was near. The next step in her miracle was flying to Los Angeles (she didn't speak English and would be alone after her father spent a week with her) and into the care of Dr. Peter Grossman, who was going to mend her. She stole the hearts of Dr. Grossman and his wife as well as many others. What a journey - the gruesome pictures of Zubaida before her operations are horrific and a cruel reminder of her critical condition. Visit Dr. Peter Grossman's website at www.grossmanmed.com/zubaida.htm for more information. Also, you can visit the website of the Children's Burn Foundation for more information. You can also visit author Anthony Flacco's website for much more. Conclusion - A remarkable and reassuring tale of human kindness at its very best - very moving.